Screen could arising up from the mechanism and rotate 90 degrees to the tabletop if user would to present information by wireless controller. Screen could coming down into the mechanism and keey same level with table if finished used. Screen could vertical flip up 90 degree automatically and stop at any position by switch or remote control. Product supply protect hand from clamping function, adopt infrared ray sensor to provide safe environment for users. Once get stuck by hands, finger or pan during monitor flip up or down process, the mechanism will stop and will continue working if barrier take away. With hand protect function, mechanism provide highest safe operation environment for users. 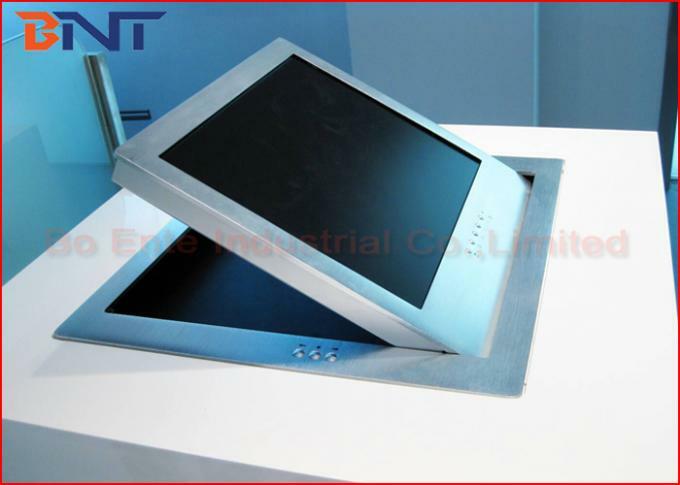 Computer monitor lift was workable on office desk, meeting table or other office furniture, is widely used in high-class conference system, like meeting room, conference room, training room, big hotel hall. 1, Supplied with highest safe operation protection, mechanism adopt infrared ray sensor to provide safe environment for users. During screen motorized flip up or down, it will stop if stuck by hands, finger, pan or book during operation. And will continue working if barrier get always. So it would protect hands or finger from jammed. 2, Motor drive rotating design, could rotate the monitor 90 degree to present information vertically. Or flip up monitor at any position as required by switch. 4, Computer monitor lift could integrated with 15.6, 17.3, 18.5 inch FHD LED screen for data, image, sound all information presentation. 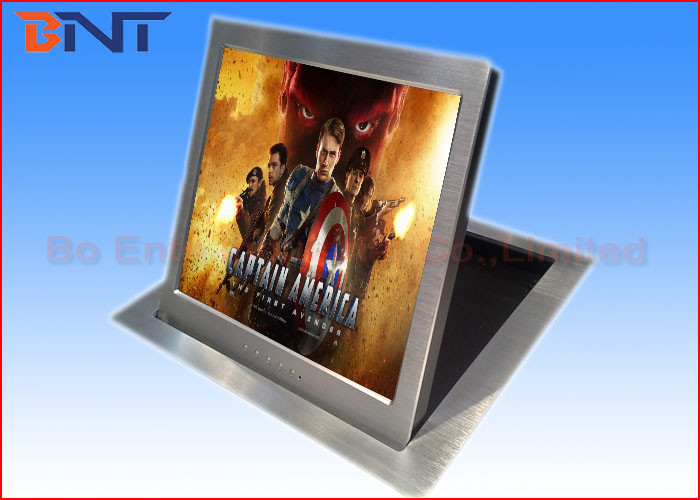 5, Made of 6mm thick aluminum alloy drawing panel and brush aluminum alloy monitor shell, provided smart, elegant and high grade appearance. 6, Whole complete lifting equipment integrated with 17 inch screen.